John Gawel was doing pretty good for an old soldier on Tuesday when some area veterans, friends and family braved the stormy weather to celebrate his 100th birthday. 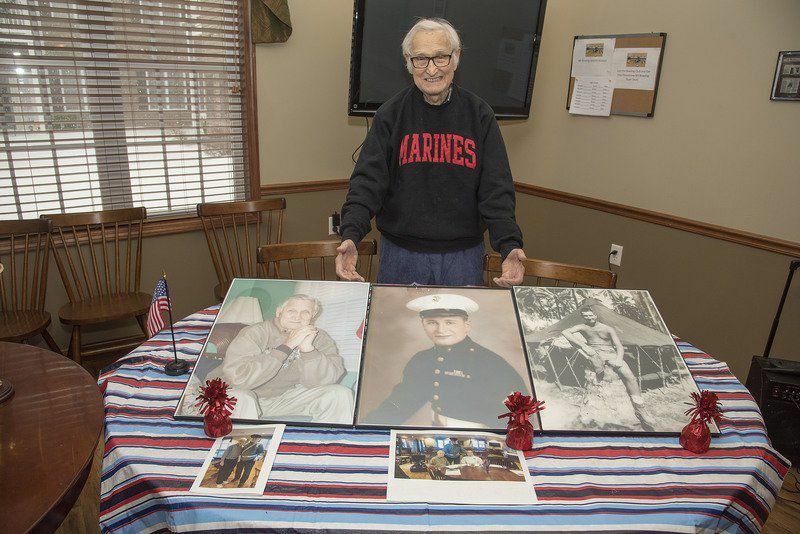 Gawel, a resident of Forestview in North Tonawanda, was the guest of honor at a breakfast party in the dining room at the senior apartment complex to honor both his birthday and his military service. The former Marine, who served on the front lines in Guadalcanal and was shot in the leg, was later sent to Okinawa where he participated in a bloody battle against Japanese resistance fighters. He was one of seven who survived in his company of 66 men. His time in the service netted him six medals, including the Purple Heart. All that honorable service is only part of the story of John Gawel's century of life. Born the fifth son of Polish immigrants, he attended Niagara Falls schools and excelled in sports. Family members said he was nicknamed "Scoop" for his prowess on the baseball diamond — and because of the way the girls responded to his good looks. He graduated from Niagara Falls High School in 1938 and took a couple industrial jobs while playing semi-pro baseball. During his first of three 100th birthday parties, with another held Wednesday and a third on Saturday, Gawel recalled some happy memories from his long life, including the time he hit a homerun against Sal Maglie, a renowned baseball player of the era, during a semi-pro baseball game. When asked how it felt back then to hit that homer off Maglie, he smiled. "It felt good," he said smiling. "Hitting a home run off anybody feels good, especially him." Gawel, the father of three children, also is quite certain how he lived so well and so long. When asked the secret of his longevity, he said "Good living." As a retired mailman, he was used to doing a lot of walking outdoors, despite rain, snow, sleet and hail. He encourages others to do the same. "Walk a lot, don't just sit and read all day long," he said. " Walking is the healthiest thing to do." He also never smoked and never drank alcohol. "You have to live right to live a long time," he said, adding, "Smoking is the worst thing you can do." Gowel found "the love of his life" twice, family members say. He married his first wife, Helen Scarupa in 1946. They had three children and shared 35 years together. Helen died in 1981 and John later married his second love, Mary Colao, with whom he also shared 35 years until her death in 2014. His son Ron remembers his father as a disciplinarian. "All through growing up he was so disciplined with his children and his family," Ron remembered, noting his father was a stickler for brushing teeth, hanging up clothes and keeping rooms clean. "He was very strict, but not mean. He was a laid back kind of guy ... tough but easy going." "He's wonderful. He's always been my guiding light," Ron said. Ron's wife, Eileen, read a proclamation at the breakfast, sent by Mayor Paul Dyster, who declared Jan. 30, as John Gowel Day in Niagara Falls. John's son-in-law John Dolhon, husband to John's eldest daughter Barbara Dolhon, gave an emotional speech, describing his admiration for his father-in-law, how much his father-in-law taught him about life, and how he and his wife wrote to the government to help John obtain all the medals he had won and deserved, despite records having been lost. "They don't make them like him anymore," said John's youngest daughter, Diane Castranova, who was at the breakfast along with her brother and sister and other family members and friends. The celebration continued on Wednesday with another party for staff and residents at Forestview, and an open house celebration will be held between 1 p.m. and 4 p.m. Saturday.